Bentley has launched new V8 S versions of the smaller-engined Continental GT and GTC, describing them as 'grand tourers with no compromise to the luxury and quality that all Bentleys typify'. With 528PS, 680Nm and a maximum speed of 192mph, the performance-focused V8 S continue to add appeal to the 'entry-level' Bentley. 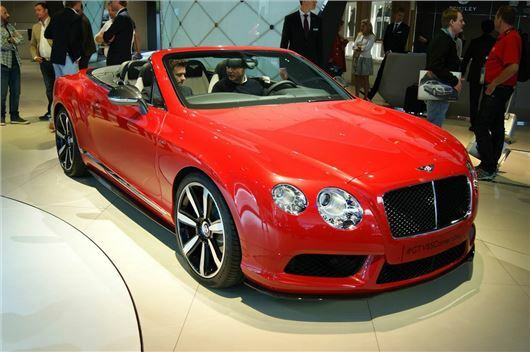 Bentley says that the Continental GT and GTC V8 S models will go on sale in the UK early in 2014, although it hasn't yet confirmed the prices. The more performance-oriented Continental once again raises questions about the relevence of the V12-engined version in European markets - Acceleration is usefully improved, with a 0-60mph time of 4.3 seconds. But the V8 S isn't just about straight line speed - its gearbox is more reponsive, and the throttle has been re-mapped, for a more sporting feel. It's also been lowered by 10mm, and the front spring rates have been beefed-up by between 33-45% front-to-rear in order to give it a more sporting feel on the road. The steering has also been recalibrated for sharper responses and increased feedback - and probably most importantly, for keen drivers, the ESC system allows more wheel slip, which means you can slide it more. Exterior modifications for the V8 S are quite subtle - there's a new front spoiler arrangement, along with a revised bodykit and rear diffuser. The biggest visual change is reserved for the grille, which is finished in black gloss in order to differentiate it from the rest of the range. Love the new Yaris hybrid R ! looks very good.want one! !